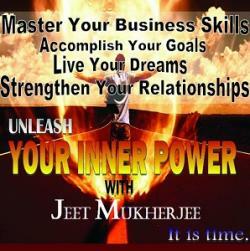 Mukherjee Worldwide » NewTribeZ.net - Empowering you! For over 13 years my passion has been helping people and businesses. I make positive difference in their lives - no matter how successful they already are - in the areas that matter most: their business, personal finance, intimate relationships, families, career and health. I’ve been honored to help thousands of people from around the world, not limiting to the top level executives. I have a special passion for small business owners, parents and students. Most of my core strategies for creating breakthroughs have come from my work with veterans in this field. I’ve used these distinctions to help optimize and grow enterprises to new and more profitable levels and personal lives towards growth and prosperity. An invited speaker for multifarious events organized by the universities and corporations around the world. Career counseling, coaching and development! Identifying the strength and polishing it while segregating the weak areas and working on it. We help clients to identify their goals and implement their vision. Coached more than 10,000 people from 15 different nationalities! The core objective is to help people in the areas that matters most - business, personal finance, intimate relationship, family, career and health. Result driven approach. We help and support businesses and entrepreneurs to grow, from around the world.